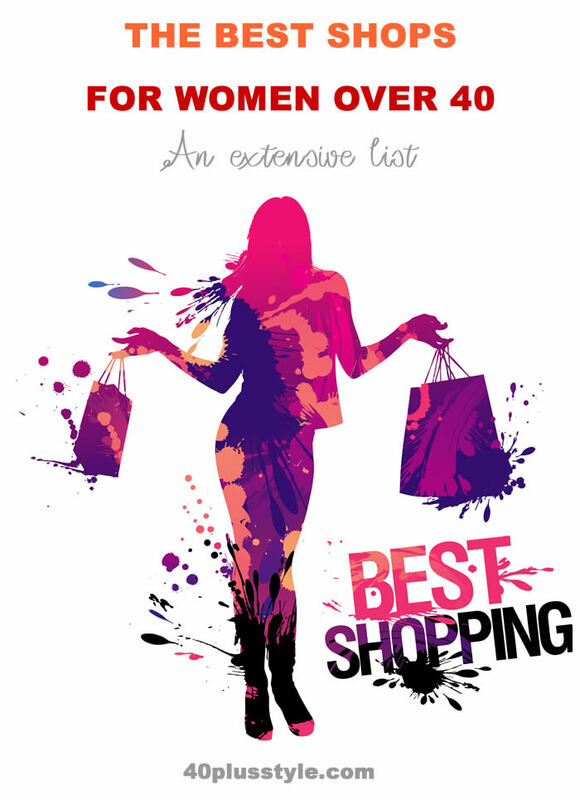 Here is a list of some of the best online shops for women over 40 to buy fabulous fashion, shoes, jewellery and beauty products online. Many offer free shipping and free returns, but always check store conditions before ordering. Happy shopping! If you like to improve your style and want to make sure you are buying the right clothes, I highly recommend 40+Style’s 5 day Find Your Style Challenge. It’s free and you will learn about dressing your body and (style) personality and how to mix & match clothes. Find out more and get instant access! Asos: Very trendy clothing that is often very affordable. Although the focus is more on young women, there is still plenty for us as well. Shopbop: a great online shop that delivers worldwide. Many of the major brands are represented here. Amazon : Amazon now has a wide range of clothing, shoes and bags and many different brands (and well-known) brands. Eileen Fisher: flattering and comfortable clothing with great silhouettes in top quality fabrics. Stella Carakasi: a great selection of casual chic original clothes that will flatter many women over 40. Enter the coupon code 40PLUS15 for an extra 15% off all orders and receive free shipping in the US! One use per customer. Covered Perfectly: Provides unique and comfortable draping tops that are flattering and cover you in all the right places! ** Special offer for 40+ style readers, use 40+ at checkout for 20% off! Nordstrom: a very extensive collection for plus size women! Covered Perfectly also has a special section for plus size women with tops that are flattering and comfortable. I created a special page for shops for plus size women here with many more shops and brands. Michael Kors: online store of this American designer with lots of great clothes, shoes and accessories. Many surprisingly affordable. Armani: designs one of the most elegant clothing, perfect for women over 40! Through his various brands he offers clothing for every budget. Tory Burch: this online store stocks a huge variety of dresses and skirts and the perfect knee height length. Also has fabulous bags and shoes. VizioOptic: one of the best online shops for glasses and sunglasses. They also stock my favorite swissflex brand. Zappos: one of the best shoe stores on the web. They stock a lot of shoes with arch support too. Visit this page to see recommendations from readers for the best arch support shoes. Shoebuy: Large variety of shoes from brands like Ecco, Calvin klein, Clarks and Anne Klein. Heels: lots of shoes here, especially shoes with heels! Portero: fabulous pre-owned/vintage luxury handbags, watches, jewelry and personal accessories. One of the best sources for original jewelry is Etsy. I have a list with some of the best Etsy shops for contemporary jewelry here. Dermstore: one of my favorite online beauty stores. Great for cosmoceutical brands like Skinceuticals. StrawberryNet: a great site for all major beauty brands, both makeup, skincare and perfumes. They offer free shipping worldwide! Bobbi Brown Cosmetics: My cosmetics of choice for makeup, BB cream and lipstick. You can find all my favorite products in our own 40+Style Shop! WANT TO SAVE THIS LIST? SAVE IT ON PINTEREST! Shop all my favorite products for women over 40 online!